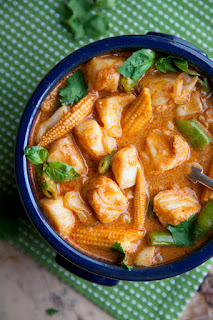 Homemade veggie thai Red Curry is a very tasty spicy Thai dish. It is very easy to make. You can serve it with a rice. To prepare homemade veggie thai red currry, firstly microwave red chillies with 2 cups water for 2 minutes. Now, add all the ingredients of red curry paste and grind to a very fine red paste. Slice baby corns, carrot and mushrooms. Mix 2 tbsp oil and red curry paste in micro proof dish. Microwave for 2 minutes. Add salt, sugar to taste and add basil leaves. Garnish it with some basil leaves. Serve hot with streamed rice. To prepare veggie thai red curry using pan, firstly take a pan add red chillies with 1/2 cup water. Cook it for 2 minutes. Now, add all the ingredients of red curry paste except sugar and salt and grind to a very fine red paste. Slice carrot, baby corn and mushrooms. Mix 2 tbsp oil in red curry paste and cook it for 2 minutes. Add coconut milk, vegetables and cook it for 6 minutes or till veggies are crisp tender. Now, add salt and sugar to taste.